Our range of products include funnel magnets. 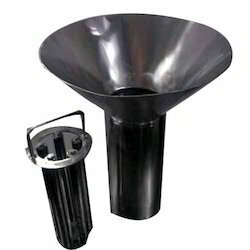 Our Funnel Magnets are manufactured using powerful anisotropic permanent magnets and are enclosed in a SS cylinder. Several grooves are provided on the top plate of magnetic filter that helps in directing the slurry towards a specific direction to offer optimum efficacy. These funnel magnets are extensively used for colours, ceramic glazes and in oil & chemical industries. In addition, these can be offered to customers with/without SS funnel. Looking for Funnel Magnets ?